I have wanted to make an arrangement skull for a while. I couldn't think of something good until I pondered going out in the cold and making one from holly leaves and berries. i decided the bird deserved those more. Also, it's really cold out. 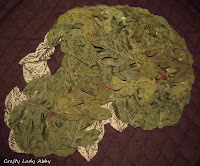 I recalled my large amount and variety of fabric leaves left over from my hair flowers. After that, the Leaves Skull was born. 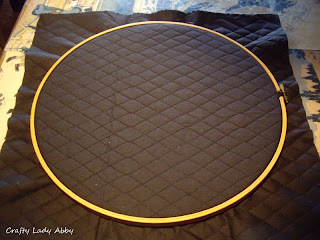 Solid color base fabric - I chose the quilted one because it was the largest piece of sturdy black fabric that I had. Iron your fabric smooth. 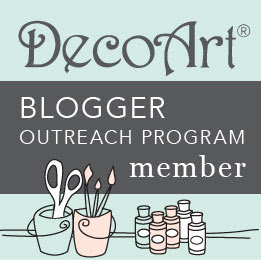 Thread that matches the fabric - This is for basting the outlines of your design and sewing the leaves on. You can use a thread that matches the leaves, for the sewing of them. 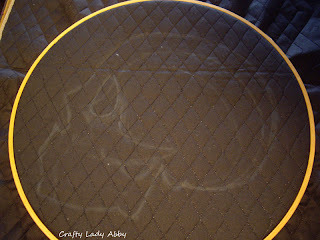 1) Lay your hoop on top of your fabric. 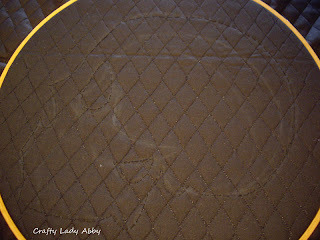 Cut a square of fabric larger than the hoop. 2) Separate your hoop pieces. Place the smaller continuous hoop on the table. 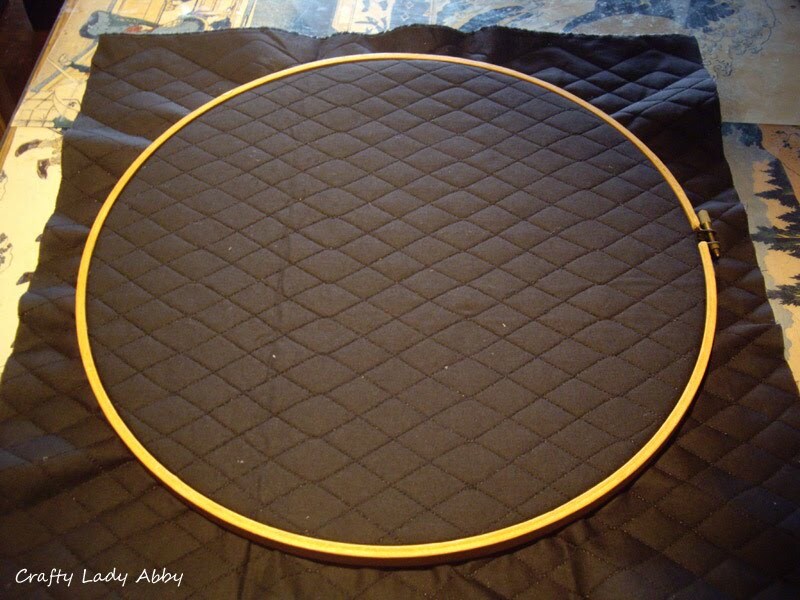 Center your fabric over the smaller hoop. Open the screw of your larger hoop. Place the larger one on top of the fabric and secure to the smaller hoop. Make sure the tension on your fabric is as even as possible. This is with the hoops secured with the fabric. 3) With your pencil, draw your design on your fabric. A nice thing about the pencils is that you can rub the line to make it fade, if your need to alter your design. You will notice several lines inside the skull. This is because I was increasing the skull size. The lines will be covered by leaves, to it's not super important that they wrong ones are still visible at this step. 4) With your threaded needle, baste around your correct design lines. Because the lines smudge, the basting will help you see your design while laying and sewing leaves to it. 5) I started with smaller leaves (the shiny ones) to fill in the small detail areas of the face and jaw. I arranged them and pinned them in place 1st before sewing. The arrangement is based off the shape of the design and individual leaves. I used the black thread to sew the leaves in place. You can use thread that matches the leaves if wanted.. I happened not to have any that matched. If you don't want to purchase two sizes of leaves, you can use your scissors to cut smaller leaves out of the larger leaves. In retrospect, I should have done that, so they were all the same shade and finish. 6) After the small leaves are attached, start filling in the remaining design area with the larger leaves. Take notice of the leaf shape when filling in. You can use your scissors to reshape leaves if needed, so they will fit better. I only did that on the side of the eye. Pin the leaves in place in groups. Sew them to the fabric. I suggest pinning in groups because you can sew through overlapping layers, which saves thread and time. 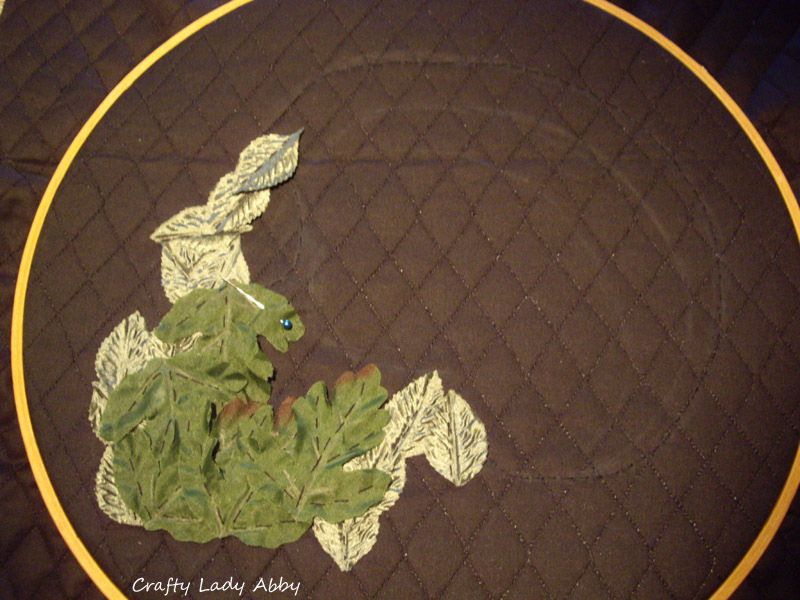 When sewing, I followed the veining on the leaves, so the stitch placement made sense visually. Keep doing step 6 until the entire design is filled in. I meant to leave the jaw hole uncovered. I must have been distracted by the TV when I accidentally covered it. Oh well. Mental note for future projects with a similar method...pay attention to all detail. This is a cropped photo. There is still a lot of extra fabric around the piece. I haven't decided if I will make it into a tote bag, fancy pillow, or just frame it. If you don't want to use leaves, this technique is also possible with things like flower petals, feathers, trims and fabric scraps. This is something I will explore in the future.